Interview with the Muppet Elmo | What I think About When I Think About Writing. Browsing through Mashable.com earlier today, I found a lovely item that brought a touch of joy to my Monday. Fresh from his “controversial” duet with Katy Perry (and I saw no harm in it: Katy is Katy; Elmo is Elmo), Sesame Street used Google Moderator to sort through fans’ questions for Elmo, and then set up a YouTube interview with the furry little guy. The resulting 20-minute interview is both adorable and touching, and it has accumulated more than 3.5 million views over the weekend. This entry was posted in Humour, Life and tagged Arts, Elmo, Google, Google Moderator, Katy Perry, Programs, Sesame Street, Television, YouTube. Bookmark the permalink. You’ve got to wonder what those guys smoke before they write this stuff. It’s always funny and cute and my grandchildren and children love it. But in order to get that deep into the thinking of a child is really hard and HAS to require some kind of mind expansion! LOL! Thanks so much, Aardie I love Elmo! This was so much fun to watch and give me the needed lift after struggling with a particularly difficult rewrite! This was great! 3.5 million views over the weekend! Wow . 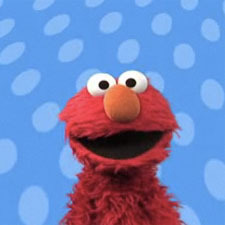 . . Elmo is a super-star, and he’s cute as a button! Sesame Street has been my all time favourite for so long…this is classic, priceless Street, Thankyou James. Hope they do the Cookie Monster next…. Put a jar of cookies in front of him and I’ve no doubt he’ll agree to an interview.